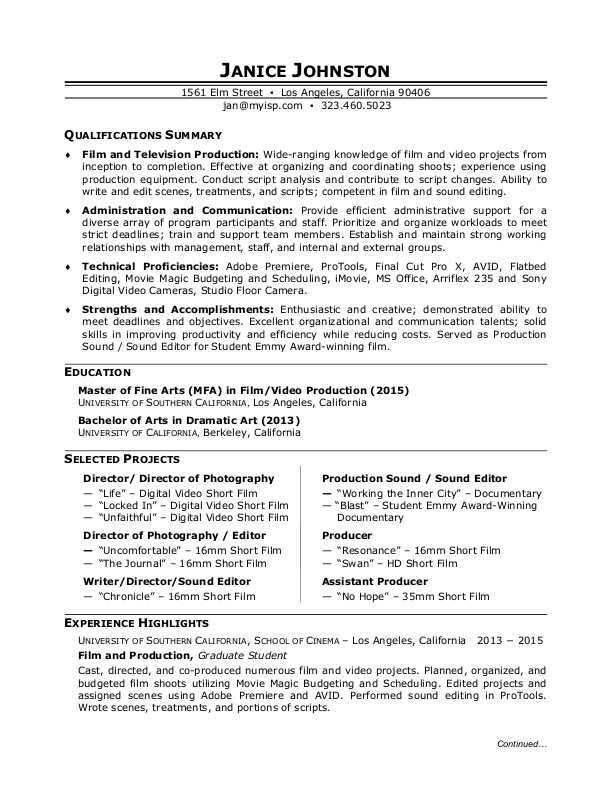 View this sample resume for film production, or download the film production resume template in Word. Just as movies and TV shows don't make it to the screen without scores of people both on and off set, your resume has a lot of components that work together to a single goal: Getting you a new job. So to be considered for top jobs on film sets, you need to take action—on your own resume. See how this nontraditional grad highlights her film production experience in this sample resume for a film production worker below, and download the film production sample resume in Word. Jobs in film production are projected to grow by 13% (or 7,600 jobs) from 2016 through 2026, which is faster than average, according to the Bureau of Labor Statistics (BLS). You'll find the highest level of employment for this job in the following states: California, New York, Florida, Georgia, and Texas; and in the following metropolitan areas: Los Angeles, New York City, Atlanta, San Francisco, and Miami. As someone in production, you can expect to earn a median wage of $58,210 per year, or $27.99 per hour, according to the BLS. Additionally, you can search for film production jobs on Monster. Film and Television Production: Wide-ranging knowledge of film and video projects from inception to completion. Effective at organizing and coordinating shoots; experience using production equipment. Conduct script analysis and contribute to script changes. Ability to write and edit scenes, treatments, and scripts; competent in film and sound editing. Administration and Communication: Provide efficient administrative support for a diverse array of program participants and staff. Prioritize and organize workloads to meet strict deadlines; train and support team members. Establish and maintain strong working relationships with management, staff, and internal and external groups. Technical Proficiencies: Adobe Premiere, ProTools, Final Cut Pro X, AVID, Flatbed Editing, Movie Magic Budgeting and Scheduling, iMovie, MS Office, Arriflex 235 and Sony Digital Video Cameras, Studio Floor Camera. Strengths and Accomplishments: Enthusiastic and creative; demonstrated ability to meet deadlines and objectives. Excellent organizational and communication talents; solid skills in improving productivity and efficiency while reducing costs. Served as Production Sound / Sound Editor for Student Emmy Award-winning film. Cast, directed, and co-produced numerous film and video projects. Planned, organized, and budgeted film shoots utilizing Movie Magic Budgeting and Scheduling. Edited projects and assigned scenes using Adobe Premiere and AVID. Performed sound editing in ProTools. Wrote scenes, treatments, and portions of scripts. Located and secured approval for land at low cost, assisted in casting, and provided input on final picture and sound edit for Senior Project. Commended by Directors for sense of humor that played a key role in diffusing tension and ensuring successful shoots. Organized information and edited and composed text for “The Entertainment Guide” (750-page publication). Assisted in determining interview questions in accordance with Production policies. Frequently worked numerous additional hours to meet strict deadlines. Evaluated petition requests for exceptions to general program requirements, ensuring consistency of policies. Tracked student progress in degree programs. Provided administrative support for over 100 Ph.D. students, 500 Master’s Degree students, and faculty. Resolved billing and registration problems. Responded to more than 50 e-mail messages daily. Oriented new employees to departmental policies and procedures. Communicated extensively with the Dean, other offices and program coordinators in the U.S., Canada, and Europe. Improved efficiency and reduced costs by introducing automated communication processes. Successfully organized induction ceremony for Beta Gamma Sigma international society of business school honors graduates. Instrumental in major improvement of relations between Student Affairs Office and students. Like a movie, your resume features plenty of different parts—all of which are important to creating an impressive final product. Could you use some reassurance that your resume can command the spotlight? Get a free resume evaluation today from the experts at Monster's Resume Writing Service. You'll get detailed feedback in two business days, including a review of your resume's appearance and content, and a prediction of a recruiter's first impression. It's a quick and easy way to safeguard your resume against landing on the cutting room floor.